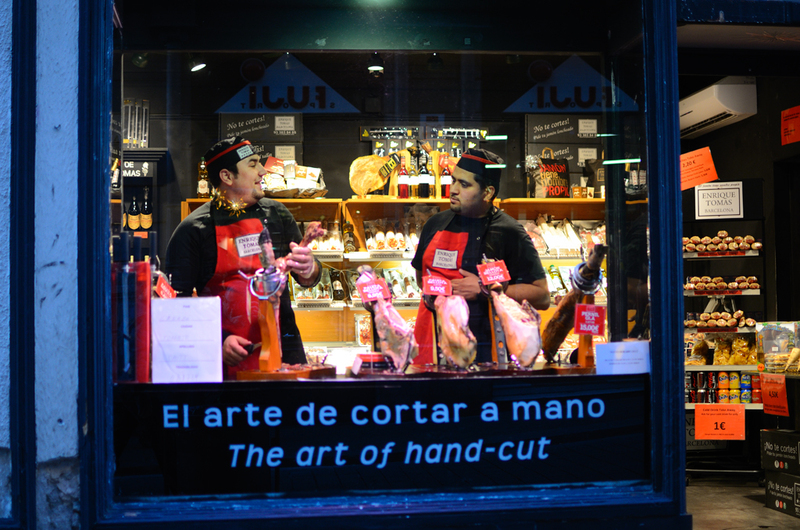 Carving Spanish ham is an art more difficult to master than it looks. It's not just about slicing any odd way. It requires skill and the right tools. I cannot teach you to carve it like a specialist but more or less you grab the basics when you've had good instructors and you've carved a ham or two to the bone. It is important to have a very sharp ham knife, which has a long and narrow blade and you should fix the piece in a ham holder, some sort of wooden framework with screws to secure both the wide end and the hoof. You start your cut from hoof to tip, that is from the upper raised part of the ham towards the bottom, first eliminating the thick fat but keeping the first slice of fat that you use to cover the ham meat when you finish. The very fat helps preserving the ham from drying and losing its quality. Beware you don't cut yourself. Keep your fingers off the direction of your knife's cut. It happens sometimes that it slips and you end up hurting the hand that is holding the ham. The slices should be as thin as possible and that is the difficult part. Try not to make a deep curve while you cut. The idea is to keep it flat and to cut thin. It doesn't matter if it takes longer for you and people clean up the dish before you finish serving the slices. That is normal! It happens all the time. Not everyone has the patience to go for the thinner slices and the nice presentation. The final result is definitely better. The shop in the picture is located in Barri Gotic, Barcelona, I think that it was at Plaça Sant Jaume. Wow! So it's definitely a skill one can learn but treat it like an art form to get the true finesse. Nice!